Fleet Tax Services is an independent drug and alcohol collection facility. We complete collections on behalf of various consortium’s including: Millennium Compliance Services Inc., CannAmm Services, E-Screen, Vertical and Drivercheck. We complete United States Department of Transportation (US DOT), as well as NON DOT Drug and Alcohol Testing. Express Urine Drug, Oral Drug, and Breath Alcohol collections. Our collection site is conveniently located across from the Relay Truck Stop in Beamsville, Ontario. If you are traveling on the QEW, it is exit #64 Ontario Street in Beamsville. Our facility can be found on the west side of Ontario Street. We are able to accommodate parking for large trucks (at the Relay) as well as personal vehicles, making us a very driver friendly and accessible site. Fleet-Tax Services upholds and understands the importance of privacy and care regarding policies outlined by governing bodies. We take the utmost priority in making sure all collections are completed properly and with care. We offer a hassle-free experience while booking and carrying out appointments allowing companies to book directly with our collection facility. We are also equipped with multiple certified collectors and testing rooms which allows us to eliminate waiting time for the donors. 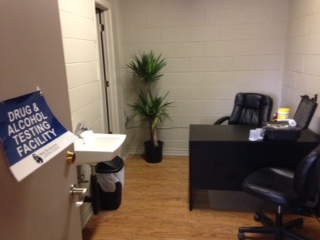 We are now the main facility for Millennium Compliance Services Inc., in the Niagara area.